a series of classroom-based "application exercises" (AES) that require teams of students to solve, discuss, and report out solutions to relevant, significant problems. 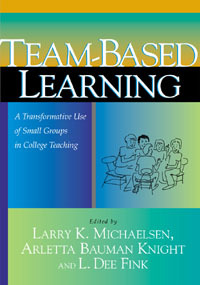 Teachers in a variety of disciplines adopt the TBL approach to increase student learning and engagement, especially for students from underrepresented groups, including minorities, women, and first-generation college students. Application Activities (AEs), which require student teams to apply those concepts in new and meaningful ways. 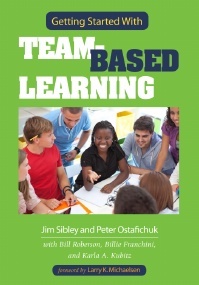 TBL is a student-centered teaching practice, with a minimum of lecturing. The Application Exercises page includes a collection of ready-to-use TBL Application Exercises, including teaching notes on how to best use the exercise in your own class. Use them as-is or adapt as needed for your own course. The TBL References and Resources page includes a large collection of valuable TBL-related information, including web- and print-based resources illustrating TBL's development, use and effectiveness across disciplines. The National Science Foundation (NSF) has supported the development and diffusion of Team-Based Learning in economics through the following grant: (DUE 1712295).